The 129,800-acre (52,500 ha) Arrastra Mountain Wilderness is located in Mohave, Yavapai, and La Paz counties, 100 miles (160 km) northwest of Phoenix and 70 miles (110 km) southeast of Kingman, Arizona. This sprawling wildland encompasses imposing landscapes and unique natural features. The Poachie Range, which trends northwest-southeast through the north-central portion of the wilderness, rises to almost 5,000 feet (1,500 m). The gradual southern slopes of the range are interrupted by several isolated volcanic plugs and numerous drainages, several of which have been deeply incised into a bright orange mudstone. The western and southern portions of the wilderness encompass more than 20 miles (32 km) of the ephemeral Big Sandy and Santa Maria Rivers. West of the Big Sandy River, the Artillery Mountains are dominated by the striking red Artillery Peak, a 1,200-foot-tall (370 m) volcanic plug. The east side of the wilderness contains the uniquely pristine Peoples Canyon. Several springs here maintain a 2-mile-long (3.2 km) chain of deep, interconnecting pools densely shaded by hundreds of sycamores, willows, and cottonwoods. Some lands in and around the wilderness are private and not federally administered. The large mountain range on horizon, right is the Poachie Range with the Arrastra Mountain Wilderness. 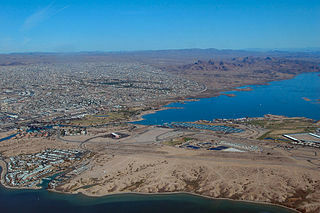 The smaller range bordering Lake Havasu is the Aubrey Hills. 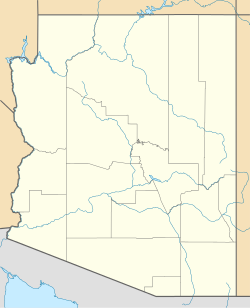 The Arrastra Mountain Wilderness is nearest to U.S. Route 93 in Arizona, a northwest-by-southeast route – (from Kingman to Wickenburg). The Poachie Range and the wilderness parallel the route 7 to 9 miles (11 to 14 km) to the southwest, with some access points to the foothills. At the north, Signal, Arizona on unimproved dirt roads lies about 10 miles (16 km) southwest off US 93. A common access route is Alamo Lake State Park at about 5 to 8 miles (8.0 to 12.9 km) bordering the Poachie Range on the southwest; the lake is the confluence of the Santa Maria River and the Bill Williams River, which then flows west to the Colorado River. Alamo Lake is accessed northwards by 33 miles (53 km) from U.S. Route 60 in Arizona at Wenden, Arizona. Access roads to the Poachie Range area, 5 to 8 miles (8.0 to 12.9 km) from the Alamo Lake area, is by unimproved desert dirt roads, and are passable depending only upon current weather events. Wikimedia Commons has media related to Arrastra Mountain Wilderness. This article incorporates public domain material from websites or documents of the Bureau of Land Management.